Research in the field of architectural history is Fujimori's principal occupation, but he currently creates architectural works, too.The main theme of his research into the history of architecture and city planning has been modern architecture, and particularly western-style buildings in Japan from the Meiji period onwards. His "Meiji no Tokyo Keikaku (Meiji Plans for Tokyo)" (pub. 1982, Iwanami Shoten), won him the Mainichi Publication Culture Award.As part of his research, in 1974 he joined with friends and colleagues to form the Tokyo Architectural Detective Agency. Carrying maps and cameras, the detectives walked around Tokyo, from the commercial arcades of the lower-class 'shitamachi' areas to the residential sections of the high-class 'yamanote' areas, seeking out western-style buildings that had long been forgotten and covered up. This endeavor resulted in the publication of "Kenchiku Tantei no Boken: Tokyo Hen (Adventures of an Architectural Detective: Tokyo)" (1986, Chikuma Shobo), which won Fujimori the Suntory Prize for Social Science and Humanities. Since then, he has continued his architectural detective work, publishing the results in all sorts of different media formats in ways that make them accessible to the general public. During his urban walks to discover forgotten architecture, Fujimori came to know Genpei Akasegawa, Shinbo Minami, Joji Hayashi, Tetsuo Matsuda and others who were 'collecting' intriguing properties around the town from a similar perspective. This encounter led to the establishment of the ROJO Society in 1986.After devoting himself to his architectural history research and writings for so long, Fujimori made a debut as an architect in 1991 at the age of 44 when he created the Jinchokan Moriya Historical Museum under commission from his hometown, Chino City in Nagano.Fujimori's architecture took a completely untried approach, enveloping a reinforced concrete structure with local stones, earth, and hand-cut planking. The result caught the public's imagination, but the architectural community was more dubious until Kengo Kuma praised it for generating fond feelings of familiarity in people who had never seen it before. As more and more people began to appreciate his work, Fujimori went on to create the Akino Fuku Art Museum (1997), Student Dormitory for Kumamoto Agricultural College (2000), Grass House (Dandelion House) (1995) with dandelions planted on the walls and roof, Nira House (Leek House) (1997), which was planted with leeks, Ichiya-tei tea house for Morihiro Hosokawa (2003), and the Takasugi-an tea house (2004), set 6 meters above the ground like a treehouse. Nira House (Leek House) won him the Japan Art Grand Prix, and he was awarded the Architectural Institute of Japan Prize for Design for the Student Dormitory for Kumamoto Agricultural College. Born in Nagano in 1946, Terunobu Fujimori studied at Tohoku University before graduate school at the University of Tokyo. He is currently a professor at the University of Tokyo's Institute of Industrial Science. Novelist, artist. Born 1937 in Yokohama. 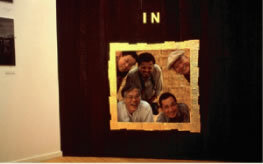 Participated in avant-garde art activities, especially with the group, Hi Red Center, during the 1960s. Received the Akutagawa Prize for Literature for Father Has Disappeared in 1981, the Noma New Writer's Prize for Snowy Field in 1983, and the Kodansha Essay Prize for Street Exploration Chronicle in 1987. Other writings include Feel of Skin, Ultra-Art Thomason, and Old People's Power. Illustrator, essayist. Born 1947 in Tokyo. After editing the comic magazine Garo, independently produced witty illustrations and essays. Received the Kodansha Book Design Prize in 1998. Writings include Mongaikan Art Museum, A Study of the Modern Phenomenon of Mounting Posters, Laughing Photographs, Hermit Sage’s Jar, The Moon of Li Bai, People of the Person in Question. Editor, executive director of Chikuma Shobo publishing company. Born 1947 in Tokyo. As an editor, published many controversial and popular books. Commented on books on television. Received Silver Prize in the book division of the Yushudo Gesner Award for In Love with Printing. Writings include Age of Editorial Madness, In Love with Printing, In Love with Books. Essayist, researcher of Meiji-era culture. Born in Tokyo in 1947. Has enjoyed research work since childhood. Began noticing manhole covers in 1970 and observed them in Japan and other world countries. Writings include Manhole Covers: Japan, Manhole Covers: Europe, Walking in Italy, Walking in France, Animals Causing a Disturbance in Tokyo. Cartoonist, researcher of Edo-era customs. Born in 1958 in Tokyo. Received Prize for Excellence of the Japan Cartoon Association for Joint Funeral in 1984. Received the Bungei Shunju Cartoon Prize for Elegant Sparrow of Edo in 1988. Writings include One Hundred Days of Vermilion, Welcome to Edo, Tour of Greater Edo, One Hundred Stories, Edo Gourmet Stories, Paradise of Wonderful Flavors. Died of throat cancer in 2005.